First. It has full manual movie mode. We see that progressive container is present and bitrate is raised. So, with very high probability we'll see higher bitrates and more fps choice in next GH. So...this thing has at least 50i progressive segmented...BUT the "flagship" Gh2 Pal version has not even 50i PsF. WTF? Exactly, what Skeptikal said. What a damn shame! Been a while since this... just had to find out this cam offers a CCD sensor..read no rolling shutter. Is it hackable? Does anyone use this camera ? Really cheap, and am keen on using it with a Nina Star as a CCD sensor with lossless 1080p. Is there a clean HDMI output ? Anyone ? > MOVIE. 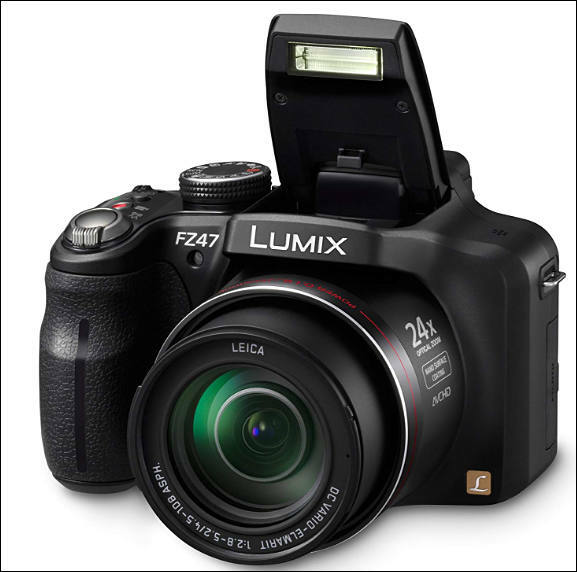 The Panasonic FZ47 can record video in either AVCHD or MP4 formats. In 16:9 AVCHD mode, image size can be either 1,920 x 1,080 or 1,280 x 720, both at 17 Mbps. At 1080, you're capturing 60i fps and at 720 60p, although the CCD outputs 30 fps. In 16:9 MP4 mode, image size can be either 1,920 x 1,080 at 20 Mbps or 1,280 x 720 at 10 Mbps. At 4:3, you can capture 640 x 480 at 4 Mbps. All MP4 movies are recorded at 30 fps. Options, set in the Menu system, include a Wind Cut to prevent recording wind noise and Zoom Mic to record distant sounds at telephoto focal lengths and nearby ones at wide-angle. Optical zoom is of course supported, as is optical image stabilization. 1080i60. Pretty smooth capture. Click here for MP4 conversion of MTS file. But the real option is to use manual settings when video recording. You can select Program, Aperture Priority (f2.8 to f/11 in wide-angle or f/5.2 to f/11 in telephoto), Shutter Priority (1/30 to 1/20,000 second) or Manual mode (both). The CCD sensor does limit Full HD recording to 60i (output at 30p) although 720 HD video is recorded at 60p with output at 30p. I've actually been having some fun with this little camera, which I picked up a month ago for next to nothing. It's like a CCD camcorder (with a bigger sensor than most CCD camcorders) in mirrorless-style body. If you pause the image right out of the camera, you'll see all kinds of nasty temporal compression artifacts. But you'll never see them during playback. The footage definitely has a "look" to it that probably isn't what a lot of people are looking for, but I like it. To answer the question above, the HDMI port only outputs in playback mode. I just wish I could get 24fps out of this camera. At present, it only shoots in 30fps. I don't think that there was ever a firmware update released for this camera, so I think I already know the answer, but is this something that could ever be hacked? Yeah, the color is surprisingly good. I like the motion too. The dynamic range is more limited than, say, a GH2 and there isn't much fine detail, but it's a more interesting image to me than a lot of what I've been seeing lately. I am still loving this little camera. I shoot professionally with the Canon Cinema line, but on my days off I find myself reaching for it more and more.